San Francisco Municipal Railway streetcar #1 was built in San Francisco in 1912. 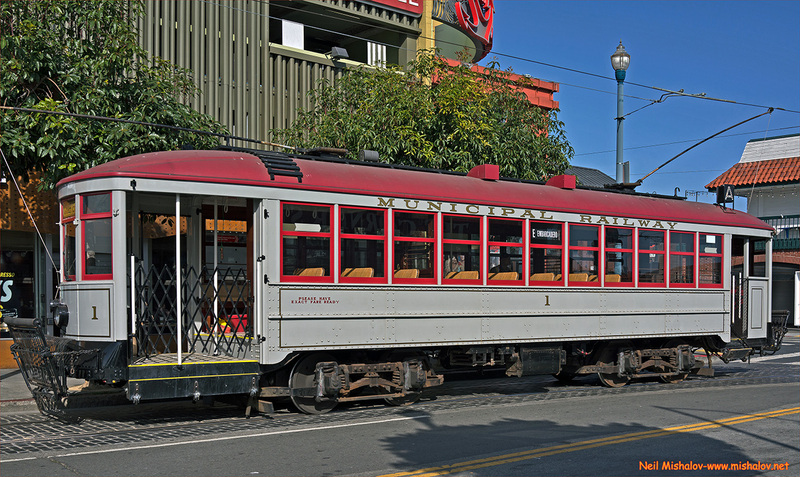 Streetcar #1 was initially used on the "A-Geary" line, which ran from Kearny Street to Golden Gate Park via Geary Boulevard and 10th Avenue. In 2009 the streetcar was restored by Brookville Equipment Company of Pennsylvania. After it arrived back in San Francisco in 2010, it was put into limited service for special occasions and private tours of the city. Streetcar #1 has been assigned to regular E-Embarcadeo line service commencing on 3 April 2018. 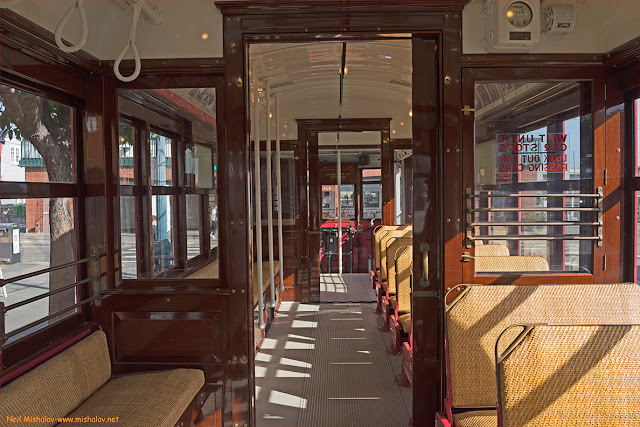 A view of the interior of San Francisco Municipal Railway streetcar #1. This is a view of Telegraph Hill looking southwest from the Embarcadero. If you look closely at Telegraph Hill, you can see the scar from a no longer active 100-year-old rock quarry. In the late 1800s and early 1900s, there were a number of quarry operators who were demolishing portions of Telegraph Hill. San Francisco was a rapidly growing city, and quarry rocks were needed for the construction of streets, city infrastructure, and buildings. 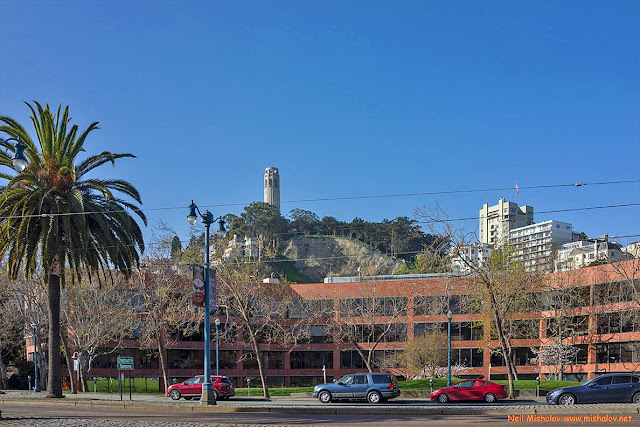 Starting in the 1890s and continuing into the early 1920s, the Gray Brothers operated a rock quarry on Telegraph Hill. 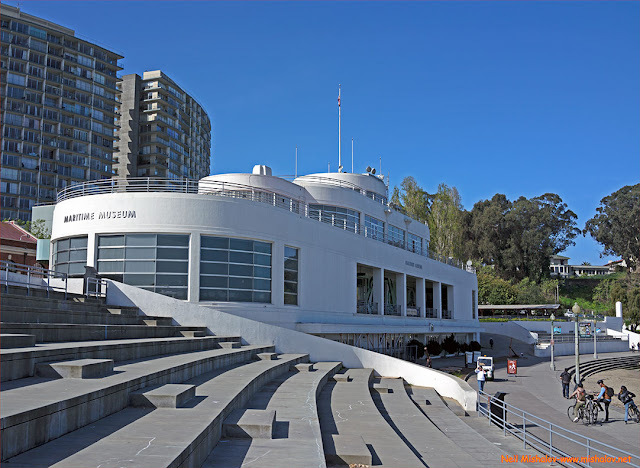 The Maritime Museum was built in 1939 as the Aquatic Park Bathhouse. The construction was a joint project of the Federal Works Progress Administration and the City of San Francisco.The maritime museum was closed from 2006 to 2009 for major repairs. The Maritime Museum reopened in 2010. This is a remnant of the Pier 43 Ferry Arch. This was a rail pier constructed in 1889. Rail barges would come to this pier from Richmond, Oakland and Marin County. 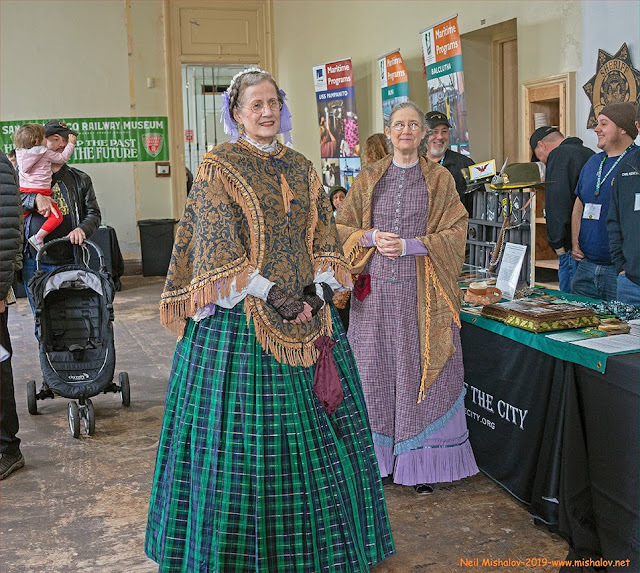 It was part of the San Francisco Belt Railroad which ran along the Embarcadero. The SS Jeremiah O'Brien, a WWII Liberty Ship is framed within the ferry arch. Here is an innocuous looking building sitting on a forgettable pier. 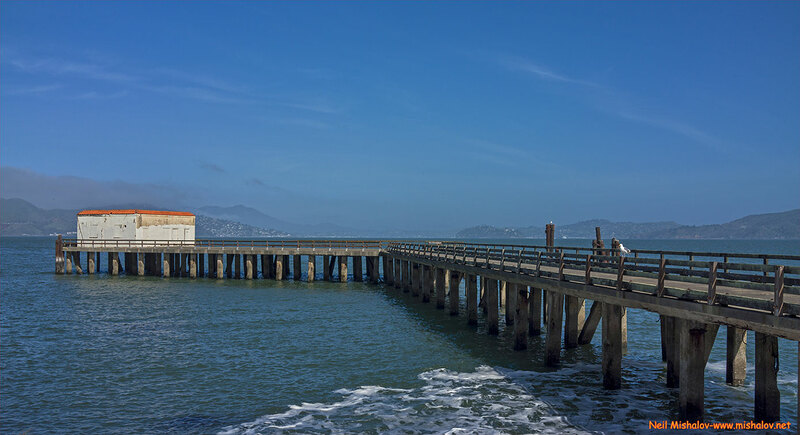 The pier is located between Aquatic Park and Fort Mason. The pier was known as Transport Wharf No. 4; it was the location from which federal authorities transported prisoners to Alcatraz Island. 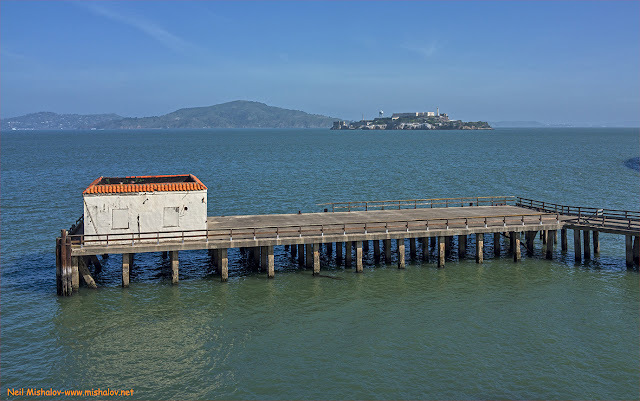 Al Capone, the Birdman of Alcatraz, and other notorious prisoners were whisked from this wharf to Alcatraz Federal Peniteniary. Here is a view of Transport Wharf No. 4 with Alcatraz Island visible in the distance. 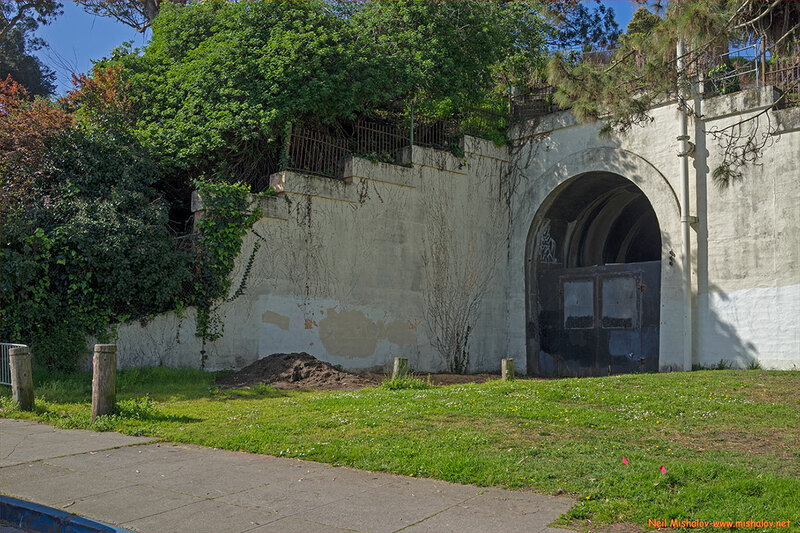 This is the east portal of the abandoned Fort Mason Tunnel. The tunnel was constructed in 1914; it was built to provide an efficient method to deliver material for the construction of the Panama Pacific International Exposition which opened in 1915. It was subsequently used as a streetcar route for visitors to the Panama Pacific Exposition. 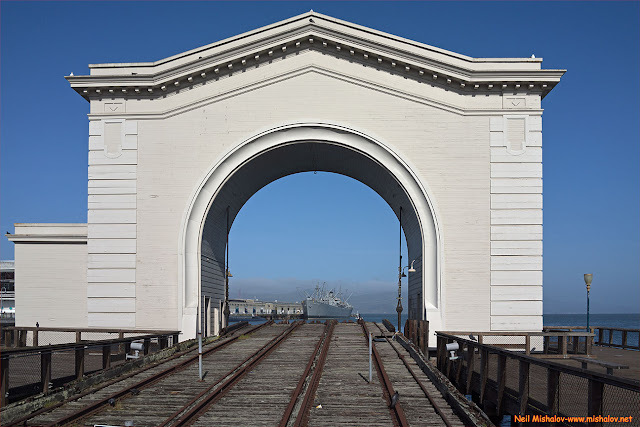 The US Army utilized the tunnel for rail access to the military Port of Embarkation at Fort Mason. During World War Two, more than one million six hundred thousand soldiers, and 23 million tons of supplies were transported to the Pacific battlefronts from the San Francisco Port of Embarkation. 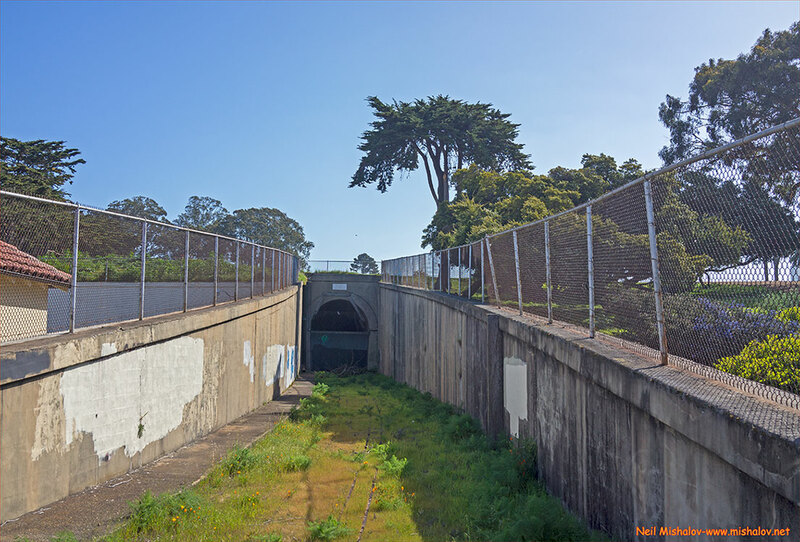 Here is a view of the west portal of the Fort Mason Tunnel. It is adjacent to the primary entryway to the site of the San Francisco Port of Embarkation. There is a possiblity that the tunnel will be renovated and used as an extension of the E & F San Francisco streetcar lines. 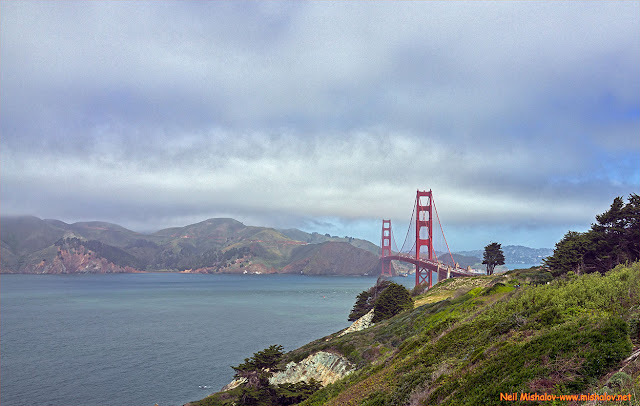 A view of the Golden Gate Bridge. The photo was snapped on what was once an aircraft landing field. 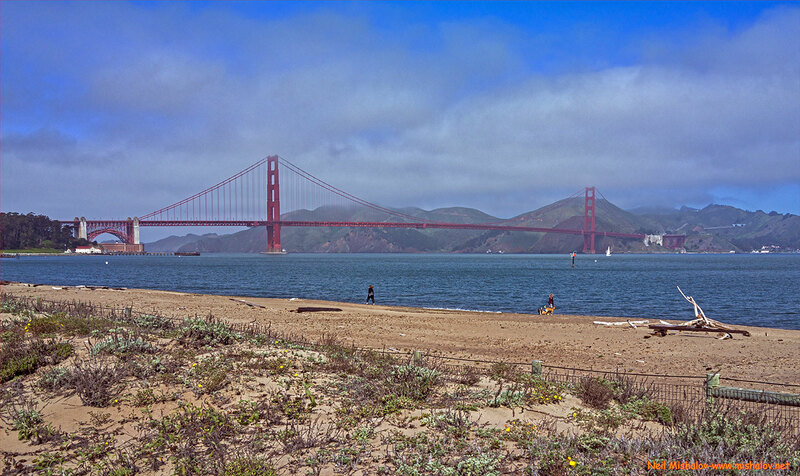 Crissy Field was the site of a US Army airfield which became operational on 24 June 1921. The Marin Headlands are seen in the distance. The view is looking northwest. This is Gun Battery Boutelle. 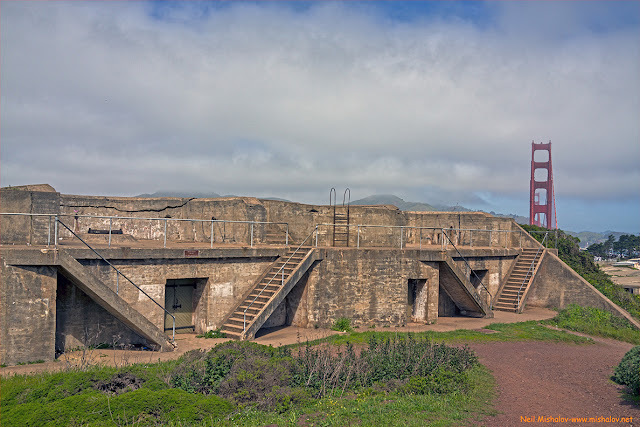 It is located within the Presidio at Fort Winfield Scott. It was active from 1901 to 1917 and was decommissioned from service in 1918. A view looking north from within the site of Fort Winfield Scott. The distance traveled was approximately 9.0 miles (14.5 kilometers). The cumulative elevation gain was about 630 feet (192 meters). Mile markers are displayed on the GPS generated track. Click on the image to see the full-size map. 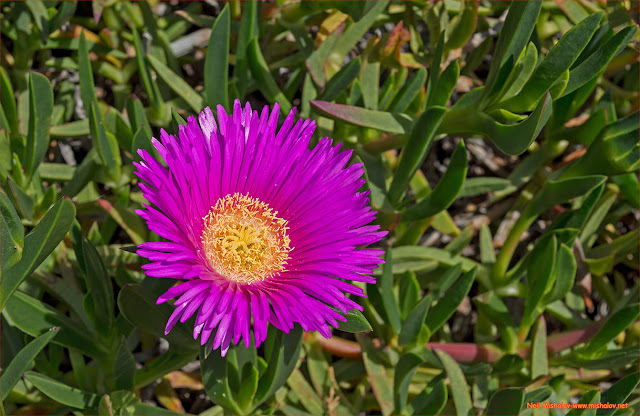 This plant is known as a Sea Fig (Carpobrotus chilensis), it is a succulent plant that is native to southern Africa. It was brought to California to be planted alongside freeways. The plant has since been recognized as an invasive plant; it is now found in parks and woodlands. This picture was taken in the Presidio. Thanks to Margot Cunningham for identifying this lovely plant.